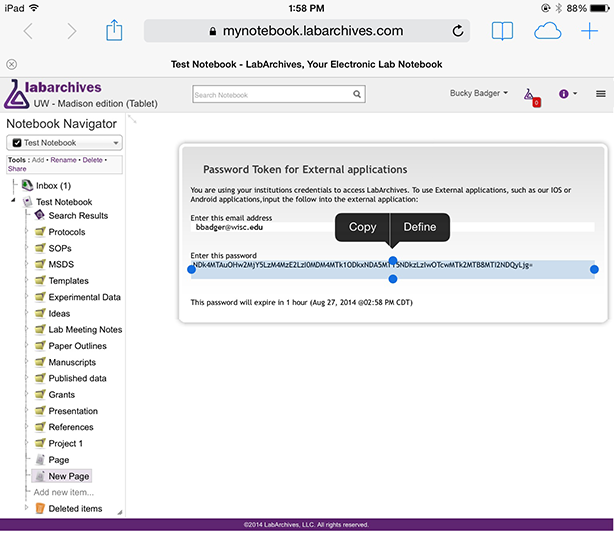 How to log in to a LabArchives mobile app or third party applications using your UW-Madison credentials. Important: Before installing and using the LabArchives app on a mobile device (either personal or university-owned), campus policy requires you to comply with the steps outlined to Secure Your Mobile Device (http://www.cio.wisc.edu/security-mobile.aspx) as it is essential to protect university data. Follow these instructions when you are using a LabArchives mobile device app or third party application. For more information about the mobile device apps see LabArchives: Mobile apps. For more information about the third party applications see LabArchives: How to install Folder Monitor plug-in (Windows only) and LabArchives: Integrate with MS-Office (Windows only) . 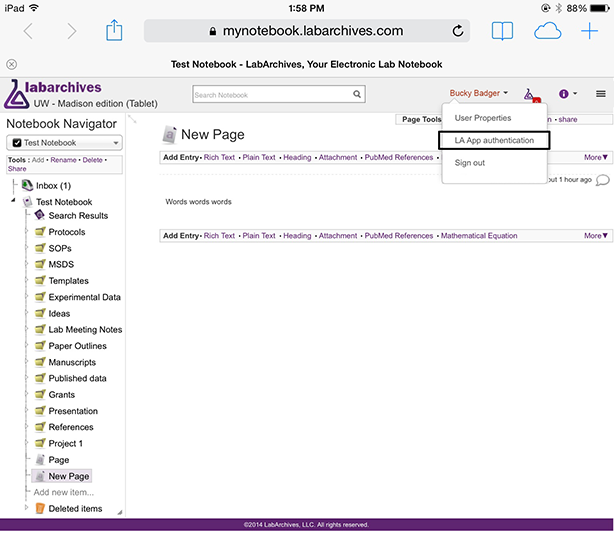 From the browser on your device, open your LabArchives account. In the dropdown menu under your user name, select LA App Authentication. A temporary password token for external applications will appear. Use the email address displayed as the username and copy the password token. Note: this password token will expire after one hour. Open the LabArchives app on your device. Enter the email address that was displayed and paste in the password token on the login screen. Note: New versions of the app may require you to repeat these steps.